I wasn't planning to buy bread even French bread (cinco de mayo) at Long's Drugstore (CVS) last night, but the store had bread displayed on sale on the aisle directly behind the checkout counters. 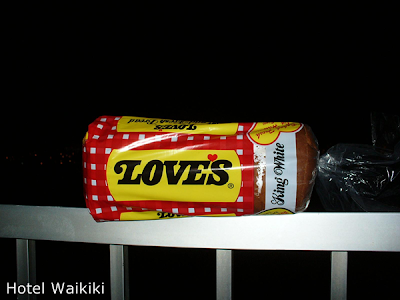 $2 bucks....just couldn't pass up the deal if you're aware of how expensive bread sells for in the islands. You would have to work two days to be able to afford the price of bread. Monday's and Tuesday's pay is what it costs to buy a loaf of bread here. Wednesday's and Thursday's pay is for butter or peanut butter. Just joking. But not by much. Weekly sales at Long's Drugs start on Sundays, and I just realized today that it takes a lot of work shuffling around the various items on sale. I'm sure they have the routine wired but it's still impressive. I don't usually eat bread on a daily basis. You know that already. Yea, you already knew that. Still among the best things to enjoy in town is driving by Love's Bakery on Middle St. and oh, the aroma. Captain Cook who "discovered" Hawaii, originally named the islands, the Sandwich Islands, in behalf of his namesake sponsor, the Earl of Sandwich back in England. Also, I was at Sears today and was looking at this gas oven, and out of nowhere, meaning I didn't need a floor salesman interrupting me, a salesman appears behind me, and blah blah blah, so much for Wordless Wednesdays. I couldn't find the broiler pan in the oven that I was looking at, and when I mentioned that to the salesman, he postulated that perhaps in this instance the oven didn't come with a broiler pan. "How I going broil something, then?" The salesman replied that I would have to go out and buy a separate broiler pan. Like this salesman didn't even bother to shave, and I'm thinking to myself the way you think when you don't necessarily want the person next to you to know what you're thinking, "what a stupid answer." (I'll have to buy myself a broiler pan.) Classic stupid. YAY! The return of lanai photography! Ann- without further ado, then. Unfortunately, customer service leaves much to be desired these days. And the folks who are supposed to deliver it either don't care, are poorly trained, or stupid. Don't you think it was better in the old days? I love the aroma of bread being baked in the oven. You should try making your own. Buy a breadmaker. So easy! Anon- I bet somebody could write a best-seller compiling all the dumb things said by floor salesmen, and their poor service. gigi- I really don't eat that much bread to make it worthwhile. However, I've heard raves about those breadmakers appliances. Hmmmm... I just wrote a long comment and something went kaplooey with Blogger. Sheesh. I was just mentioning that I read somewhere that the Earl of Sandwich invented the sandwich (putting meat between two slices of bread) so that he could eat and play cards at the same time. I don't know if it's true or not. Kay- c'mon....da earl of sandwich invented sandwiches? I just checked "Comment Moderation" and nothing there. Dunno.